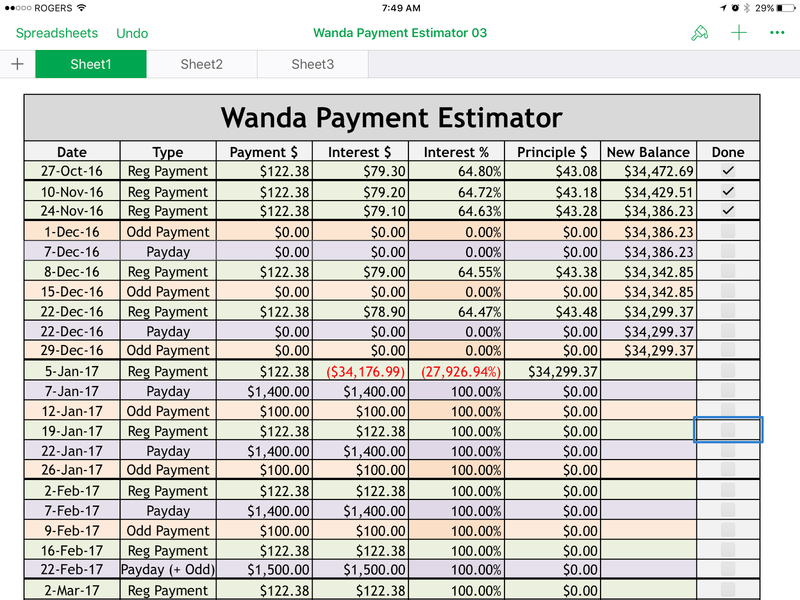 Just because I have paused beginning the Wanda Paydown Plan one month does not mean that I have paused my study of the Wanda Loan. Today was a regular Wanda Payment, so that means that the balance of the loan has changed this morning. 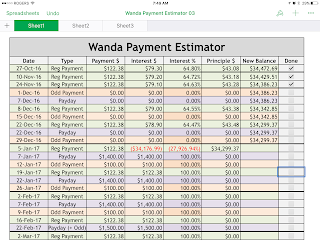 So, with new balance in hand I have plunked that into my Wanda Paydown Estimator Spreadsheet and a pattern is emerging. I have notice that with each and every Regular Wanda Payment that the amount of Principle that comes off of the Outstanding Balance increases by 10 Cents! With this info in hand I have speculated what the payments in December will look like and see if I am correct. Again this is part of my plan to be able to predict what will happen in the future of this loan. Why is that important? Well when I start to pay down in earnest this loan, I want to be able to accurately predict how quickly I will actually pay this loan off. Why is that? Well I want to know if my plan will help me hit Total Debt Freedom Day (Nov 7, 2017) or not. As well, in a nerdy way it is kinda fun, and feels like I am cheating the system sorta. Just in case you are curious, here is the spreadsheet as it stands now. Just FYI: The checkmarks on the side let me know if that payment has actually happened or not. So it is a quick way to let me know where I am in this ever changing spreadsheet.